Last Thursday was American thanksgiving, I prepared a message not because it was American thanksgiving, it’s because last week I really reflected on the world that we live in. Full of chaos, difficulties and hardships, and these somehow speak the message of thanksgiving, and I tell myself why in this kind of situation, I had to speak about thanksgiving. The world we live in is quite gloomy, almost every week, something terrible happens. You don’t know what’s happening. There’s no safe place in the world. When you go to a concert, it’s dangerous when your in a train it’s dangerous, even when you go to hospital, it is dangerous. There’s no safe place. We don’t know what’s happening. That Paris tragedy that happened yesterday I just found out that one of our and members was in Paris when the attack happened. This world is getting more and more crazy. Gratitude is difficult because our senses are not very good. Uh, this kind of situation, we can get down very easily. He can be easily swept by the dark mood of our environment, but we don’t want to be sad all the time. You don’t want to fear all the time. You don’t want to feel down all the time. And many people are really tired, tired of being affected by circumstances which fluctuate all the time, always be an up and down. And also we realized that we can never make circumstances that can make us happy. Circumstance that just happened. That’s the reality. That’s an isolated regardless of wishes, circumstances just happened. Sometimes good things happen. 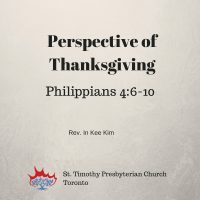 A lot of times bad things happening in our lives, as we reflected on Canadian thanksgiving, Gratitude is not in response to all of our circumstances. Because something good happen I’m thankful, that’s only beginning of the gratitude. Gratitude is not our response or reaction to our situations, but rather I’d like to see gratitude as the attitude or perspective with which we see our reality. I think this is the currently correct way of looking at gratitude. Gratitude is not a response, It is our attitude it’s our perspective with which we see more of reality, especially when difficult situations attack us. We should not lose our perspective of gratitude, that’s when we need gratitude. When life becomes hard, when it becomes so difficult, that’s when we need gratitude. We should not lose that attitude. We should not lose that perspective. American Journal of social psychology, they studied these people after the 9/11 in 2012 and they discovered that people with positive attitude, including the gratitude were able to cope with the tragedy much better after the terrorist attacks on September 11th, 2000, he found that gratitude gave the people the resilience, the power to persevere, to fight against depression. I think there is power of a simple thank you, when we are able to say thank you. There is power behind this short phrase. Saint Paul said into this passage “do not worry about anything but in everything by prayer and supplication with Thanksgiving. Let your request be known to God”. In other words, in all circumstances, pray for thanksgiving. He didn’t say this when his situations were terrific and great and good. Where did he write Philippians? He wrote this letter in prison. While he was in prison, he said “Give your request with Thanksgiving.” So to Paul, Thanksgiving was not a response. Well, it’s not a reaction to his situation. It was his perspective. It was his attitude with which he sees the reality. I hope that all of us have the wisdom, all of us have that perspective and attitude towards life, and our life will become better then living with constant complaint. When we live with this perspective, what happens to us? When we live with thanksgiving what happens within us and your internal world, What will happen inside us? I asked a KSM member this question, and then all they said was positive energy, just really loud voice. Saint Paul said “here the end is very important.” He first said, “give your request with Thanksgiving, and that peace of God which surpasses all understanding will guard your hearts and your minds in Christ Jesus.” That’s what will happen within us. When we live our lives with Thanksgiving, and peace of God that surpasses all understanding will start flowing within all parts. And that creates a positive energy. The peace of God will give us the resilience, resilient power to resist against the dark power of this world. We lit up the first candle today, first advent. As this candle lights up the dark room. Our Thanksgiving becomes that light to fight off the dark power of this world. may we respond to our life with Thanksgiving especially when life becomes very difficult. Peace of God will be available, and God will give you the peace of God. When life is difficult, let us not complain, I think that’s a stupid thing to do. It’s a natural thing to do, but it is a stupid thing to do, an equally difficult time been spent complaining, that’s a weakness. The strength is really respond to it at Thanksgiving. Strong people do it. Weak people will complain, and as soon as you start complaining, you see yourself falling into the world of negative thoughts and negative feelings. Present your request with Thanksgiving to God and Gospels. God’s peace will guard your Hearts, thoughts and minds. That is the power of simple thanksgiving. I realized that that is a secret of happy people. All the happy people that I’ve seen, the homeless had this pamphlet actually that tells us if that you look deep inside there is a gratitude operating in the lives, but when we see unhappy people, I hardly hear “Thank you.”. I don’t see much of thankful attitude. So I realized that, this is where happy people and unhappy people are separated. That is thankfulness. The goal of spiritual maturity is in order to be a thankful person, has a mystical experience, in all circumstances how can you be thankful? That’s a mystical experience, that’s some mysterious power. Meister Eckhart, which a spiritual giant kills so many books on spirituality and Meister Eckhart said this, if the only prayer he said, “Thank you” That will be enough. It’s a profound statement. Only prayer they can say is, thank you. That’s good enough. In other words, ultimate level of your prayer, is prayer with Thanksgiving. I think thank you, is the nicest thing to say both to God and to other people. I asked KSM members, Say Thank you, Teach your children to say thank you mom. For the smallest thing we have to teach them. Thank you is a nice thing to say to God and to other people. It is so easy to overestimate the importance of our own achievements compared with what we owe to the health of others. The reasons we are here, It’s not because I have worked so hard and I have achieved so much or I, I have so much talents and gifts. The reason we are here at this age, it’s because there had been many people who help us deal with our problems, difficulties. There were so many people who helped us. There are more people who helped us. But sometimes we forget that and we complain, instead of the thankful, we live our lives indebted to God and indebted to other people. I think that’s a basic humanity. Recognizing it, recognizing that and realizing that, our basic humanity lives in to God and indebted to the people around us. So living with gratitude, it’s just such a rapid response, appropriate response. This most appropriate response also liberates us from pride, greed, worries, negative thoughts and negative feedback, and were supposed to live with gratitude but that lifestyle liberates us from all of these negative things. In a university study, two groups of students, one group students write a Thanksgiving Journal and then the other students write anything. After 18 months they started these guys were much, much happier with their lives. Write a general thanksgiving, anything, write down five to seven reasons why we’re thankful, very easy. Write in detail rather than I’m just thankful for life, I’m thankful for so and so. So for me, I’m thankful for the praise team and I’m thankful for this and thankful for that, This can easily fill us with happiness. As you just started doing that, you start focusing on the beauty of life rather than the ugliness of life. And now I realize why God wanted me to say the message of Thanksgiving in this dark and gloomy world, our thanksgiving is a protest, our Thanksgiving is our fight and will not let us down. We’ll live with thanksgiving, and we will fight against whom tries to destroy our soul.